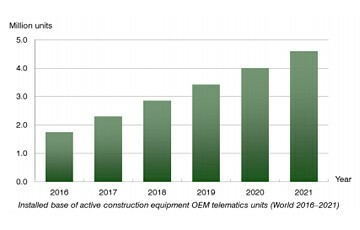 Berg Insight estimates that the global installed base of active construction equipment (CE) OEM telematics systems reached almost 1.8 million units in 2016. Growing at a compound annual growth rate (CAGR) of 21.3 percent, the active installed base is estimated to reach 4.6 million units worldwide in 2021. This includes all CE telematics systems marketed by construction equipment OEMs, either developed in-house or provided by the CE manufacturers in partnership with third-party telematics players. Berg Insight estimates that the European market accounted for almost 0.4 million active construction equipment OEM telematics systems at the end of 2016. The North American market is estimated to be slightly larger than the European. The Rest of World represents more than half of the global installed base of CE telematics systems provided by construction equipment OEMs. Most major construction equipment OEMs have introduced telematics offerings for its customers either independently or in collaboration with telematics partners. OEM telematics systems are today commonly factory-installed as standard at least for heavier machines. 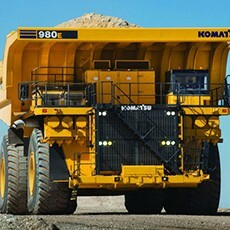 Berg Insight ranks Caterpillar and Komatsu as the leading construction equipment OEMs in terms of the number of CE telematics systems deployed worldwide. “The leading construction equipment manufacturers by market share are unsurprisingly also by far the top players when it comes to the number of OEM telematics subscribers”, said Rickard Andersson, Senior Analyst, Berg Insight. Other key players include Japan-based Hitachi Construction Machinery and South Korea-based Hyundai Construction Equipment as well as JCB, Volvo CE and Deere & Company which are based in the UK, Sweden and the US respectively. South Korea-based Doosan Infracore, Liebherr based in Switzerland and CNH Industrial which is headquartered in the UK all have global installed bases of construction equipment telematics units in the low tens of thousands. “Notably, half of the top-10 OEMs have surpassed the milestone of 100,000 telematics units globally”, concluded Mr. Andersson.